For 100 years, American Cord & Webbing Co., Inc. (ACW) has been a leading designer and manufacturer of narrow fabrics, sewn strap assemblies and injection molded plastic hardware produced for both military and commercial use. There was a problem with the video code. Please make sure the embed code is correct in the page admin. Since 1917, we have provided the highest level of quality products and commitment to our customers. Our combined years of experienced industry professionals, along with our commitment to service and quality, are unequaled in today’s marketplace. ACW is recognized as an industry leader in innovative design and engineering. Our full line of Berry Amendment compliant webbing and plastic hardware products are manufactured to meet or exceed customer and market requirements and expectations. ACW manufactures a complete line of Berry Amendment compliant, UL Approved, injection molded plastic hardware for military, industrial and commercial applications. In our RI manufacturing facility we have advanced automated and computerized equipment, which is utilized to perform an array of fabrication and assembly functions including sewing, cutting, punching and packaging. Our engineers and design staff work with our customers to develop cost effective solutions to fabrication and assembly requirements. Webbing: ACW offers Flame Retardant (FR) treated nylon webbing that meets horizontal and vertical burn testing (FAR 25.853). In addition, our Kevlar, Nomex and PBI materials meet NFPA standards. 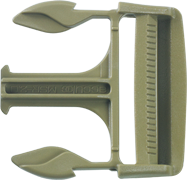 Plastic Hardware: ACW’s FireLoc® line of heat stabilized nylon injection molded plastic is designed and manufactured for high heat applications. ACW prides itself on the professionalism and tenure of our employees, which includes the skill sets required to develop custom products. Our knowledgeable and highly trained staff provides customers with relevant product information necessary to make an informed buying decision for their application needs. Our commitment to customers is second to none. 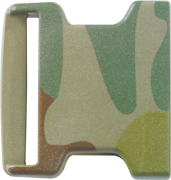 ACW makes a complete line of military plastic buckles, slides, and loops, available in government approved Infrared Reflectance (IR) colors. We create narrow textile webbing and a complete line of plastic hardware products for military, flotation, marine, and medical applications. ACW manufactures a complete line of webbing and plastic hardware products for apparel, luggage, backpack and other commercial applications. We would like to hear from you. Whether you have a question about our company, want to request information or have a comment about our service, send us an e-mail and you'll receive a prompt reply.